Game week 20 was a bit of a disaster. I was hoping to make an improvement on a poor game week 19 but ended up slipping further down the leaderboard. It’s a difficult one to understand as I’ve felt for most of the season that the team has been well set up and performing nicely. This is probably the first season of playing the game where I’ve felt completely in control with decisions falling into place easily and not having to rush into making transfers. In fact most months I’ve had all of my transfers left and have still been placed within the top 5,000 teams. I think Liverpool’s consistency in keeping clean sheets is really starting to do some damage for me, as I only have Robertson. Mane not performing hasn’t helped either. Son and Jesus have both generated big points over short periods of time as well. Cleans sheets for Robertson, Laporte and Lindelof. A clean sheet for Robertson almost does me more harm than good (based on the Liverpool blocks around) but less harm than if I didn’t have a Liverpool defender. It was good to see Laporte back in the starting line up and anything from Lindelof at 1.9m is a bonus. Although I was a little surprised the latter didn’t get a 7+ rating. 5 points from Sane wasn’t huge but it was at least something. A goal and star man for Salah was another positive. Obviously Kane picking up an injury is an issue, however with three transfers in the bag this might actually play into my hands. Mane once again drew a blank, I’m quickly losing patience with him and this might be the week he has to go. Aubameyang scored nothing, which is a concern. Although I don’t fully understand why everyone quickly wants to remove him after a couple of bad games. He is still by some distance the third highest scoring striker in the game after all. With three transfers in the bag and with Kane having to come out, my possibilities are almost endless. Whoever I replace Kane with is going to free up a big chunk of budget to upgrade elsewhere. Looking at the stats for the season so far it makes sense to jump on the Liverpool clean sheets bandwagon. However if you look at the reality of the situation it makes less sense. They’ve got a lot of injuries defensively and over the next couple of weeks they play 1 game, whereas a team like Man City play 3. As a result I won’t be going for the obvious choice of Van Dijk for the time being. This brings me to Kane. For me there’s only three players to consider as a replacement – Aguero, Jesus or Rashford. If Aguero was certain of a lot of game time it would be an absolute no brainer. I don’t overly rate Jesus (although credit to those who got him in recently) and I’m not completely convinced that Rashford will consistently score goals or start games at Old Trafford. As a result I’m going to go for Aguero. I’ll obviously check line ups before City kick off and I wouldn’t be surprised if Aguero doesn’t start, however I may still be tempted to go for him with the return leg against Burton approaching. He can’t surely be benched for both games. This leaves me with two transfers and some money in the bank. The other player that stands out is Mane. He’s not someone I’ve wanted to remove previously – high ownership in my mini league and a player capable of an explosive week at any point but this doesn’t seem to be happening. Mane is now the 4th highest owned midfielder in the mini, Sterling is the 2nd. As a result it’s more of a risk to not have Sterling. This also makes sense in terms of points already on the board – Sterling has more and in terms of upcoming fixtures. As mentioned above Liverpool are out of the FA cup meaning they don’t have a game next weekend and Man City have the EFL cup second leg and an FA cup fixture. City also have an easier game in the Champions League. This would leave me with one transfer for the rest of the month. I’d plan to hold this one at this stage. With regards to general tips for the upcoming game week. Chelsea and Arsenal face each other so I wouldn’t be looking at any of their players at the moment. Although Chelsea do have the second leg of the EFL Cup against Spurs in the week – a game they must win if they want to progress. City look like the team with the best fixture as they face Huddersfield at the weekend. Liverpool host Palace and Man Utd host Brighton. Spurs travel to Fulham but without Kane or Son it’s difficult to know how they are going to perform in the short term. For me, the funds will be utilised better in the spread of the team. Arsenal seem to be in poor form and aren’t creating chances, and arsenal play Chelsea, Spurs and City (if I remember right) in their next 4 game. Yeah it makes sense in this situation. I’m just slightly cautious about using all three transfers in one go. Ultimately if he doesn’t start performing he will be the next one to go. I need to really otherwise I’m only just priced out of my Richarlison / Kane to Sterling / Aguero double swap. An option I’ve looked at is Auba to Rashford until GW24, where Arsenal fixtures seem to be very favourable. If I play my timing of transfers right I should be able to capitalise on price movements to make this reverse swap using just one transfer. Do you think you will go for Aguero even if he isn’t starting? I’m tempted to just stick him in anyway as he may play against Burton to bring his fitness up. I agree with keeping Auba. I think people are looking at his next 3 fixtures and wanting to ditch him. 2 of his next 3 fixtures are not great with arsenal playing chelsea and man city but he’s the type of player to score vs anyone. Arsenal play cardiff at home in between them games which is nice. February looks good on paper for him with games in the league vs Huddesfield, southampton, bournmouth and two europa league games (If he plays of course). Yeah the Cardiff game is certainly one to keep on the radar. I wouldn’t be getting rid of him with that game around the corner. He’s got a good amount of points on the board so far as well. Auba should be kept, high scoring player and going for top scorer in the premier league. He also has some very tempting fixtures coming up. Over the course of the the next 4 weeks I expect him to score more than rashford for example (well I hope so anyway). This is a really good article dtt. Thanks for sharing. Thanks Dan – glad it’s not just me who thinks Aubameyang is worth holding onto to. Hopefully he can put a bit of a run together. I sold Aubameyang for Jesus, I think I did the right move. Might go the opposite move in Feb as Thomas mentions good fixtures above. Not ruling out Lacazette either as he might play those European games. Also depends on whether Aubameyang is playing on the wing. Right now happy enough with Aguero, Jesus and Salah upfront for the rest of the month. On a separate note, the higher you go up the overall rankings, the more Liverpool blocks you will encounter, the top 100 is absolutely littered with Alisson, Robertson and VVD. So having two Liverpool defenders might not be enough. Might have to go all out and have a complete Liverpool back 5 or go another route (City or Chelsea blocks are lurking in the background). Top 1k should be the aim and might see teams victorious in mini leagues. Agree with this, I think I’m going with 2 x Man City (Ederson and Laporte) as currently own none defensively and already have vvd, robbo and then Doherty as my other. Another defender doing well lately is David Luiz. Three clean sheets and two assists in his last four games. He does like to step up and attempt those through balls quite regularly now so those stats may not be a flash in the pan? Fixtures not great for Jan/Feb however. Can’t argue with that move based on the points Jesus has picked up recently. I just don’t rate him myself but I can still see him scoring well if he plays. Targeting those Europa League games sounds like a good idea – I’d been looking at this myself. I believe both Chelsea and Arsenal have the first and second leg within back to back weeks giving them an extra game. Are you leaning towards going with the majority on the Liverpool blocks? It’s a tough one, I think you’ve said it before but if we just follow the crowd on this one it probably won’t help us gain many places. If another team can compete with them for clean sheets and Liverpool struggle defensively with the injuries they’ve got that could be a better opportunity to make up some ground. As you well know, I am not one that follows the crowd. I take risks and enjoy doing so. As they say ‘fortune favours the brave’. Playing safe I find boring and then what’s the point in playing. Fantasy football can be a real slog, hard to find it interesting for 10 months of the year and can be hard work if spending hours on it and for little gain. I tend to make my team different from my others. ‘All round me are familiar faces (teams) going nowhere’. Recently, I had a job interview for promotion and I got the job and the reason was that 9/10 people gave the same answers, I was the only way who saw things from another angle and that really stood out from the crowd. Same approach to fantasy football, I don’t want my team to turn into a clone of thousands, I want it to its own unique identity. So I target players with low ownership in my mini leagues. So very unlikely I would adding any Liverpool defenders in my team. Maybe others are more than happy to want Liverpool defenders that leading teams in their mini leagues have had since day one. For me, it’s counterproductive. Also, I think there is more than one way to skin a cat when it comes to playing DT. Someone who sticks to the template and the tried and trusted players can be just as successful as a maverick who can capitalise in those differential monster hauls. It’s all a personal preference but I’m in agreement that I like to find excitement playing the game. We are all somewhere on that spectrum and I’d probably class myself as a balanced player who likes to dabble with the maverick side of the spectrum sometimes. Sometimes it has paid off, sometimes I’ve been burnt. Congratulations on your new job btw RR. Good work fella! Maybe too strong words but I don’t know, I just tired of reading about the same transfers, same players discussed and same safety approach being discussed time and time again. It’s like a loop, people running in circles. This safety approach is just watching Steve Davis in play, I want to see risks, Ronnie O’sillivan type of action. Something out of the norm. We don’t really have a discussion on differentials at all nor different types of strategy. I have tried to start debates but I think people are reluctant to change their outlook and follow what 99% are doing. We talk endlessly about Aguero, Salah etc but if you don’t their merits by now you are not playing the right game. I think there was over 100 comments last week and only 1 on Jesus, so fair play to the person who suggested it and got thinking about that move. Other than that, I think Chris you have done great looking outside the box as you first mentioned Doherty. Maybe I am an outsider but I want to look at the bigger picture. We can all tell the success stories of Jesus, but what about the ones that don’t pay off? The stats back up that picking up players who don’t traditionally pick up points isn’t what’s going to get the most points on the board most of the time. I applaud anyone who had the guts to go for Jesus but let’s face it, no one would have predicted that many points over such a short period of time. There was no guarantee that it was going to happen. In fact, I didn’t even consider him because I thought it was that unlikely. He didn’t score well last season, he had a bad World Cup and hadn’t started this season well. Also he probably wouldn’t have even got as much game time had Aguero not been unwell. My view is that if you pick a team of differentials you won’t do as well. Some will work but most won’t. As I keep coming back to, what matters is points on the board. From the lists above we can see the players who get the most points on the board and that’s a fact. What is a differential? I would say it is a player with low ownership in a mini league and/or in terms of overall ownership. So I would generally say players with overall ownership of less than 15%. So that includes Jesus, Son (would have been my Kane replacement but unavailable for a while) D.Silva, B.Silva and Mahrez (most have the combo of Sterling and Sane now), Chelsea defender’s Azpilicueta and D.Luiz and finally Lacazette. Mane is a potential differential as although his overall ownership is very high, his ownership in mini leagues is dropping. He is high on my shortlist for the next month as he can be an explosive talent on his day. Now from the top 20 from last season, other differentials emerge: De Bruyne (probably the best one at 10.2%), Eriksen (who I have got in my team), Alli and Lukaku. Hardly anyone mentioning these players so they are being ignored. Points on the board do matter but the overall aim is to get more points than everyone else which are two different things entirely. In order to do that, you have to do something different or special from what the general public is doing. You have either get on the train before everyone else (so you are not left standing) or find another route by seeking those players that everyone is ignoring. Now I not saying everyone should a team of differentials but I tend of a core of 7-8 essential players and then a few differentials around them. We know the essentials but we have trouble finding the good differentials. A few of these players can make the difference as Jesus showed last couple of weeks. My team was ranked 7k before I put him and now due to mainly his goals, I am now in the top 1k. So one differential can make the difference. My point is not to add differentials into our teams but then again we shouldn’t totally disregard them. Let’s talk about them, is it a waste of time? I think not as the overall leader has two of them in his team. In fact, Chris was the first to mention Doherty and I was the first to mention Lindelof. Both of these players are now in DTT team. I don’t see the point of having endless discussions whether I should have Aguero in my team, I seen him play for 7 years. In fact, I going to have both Aguero and Jesus in my team as both together will act as a differential as most will pick one or other, the general public might find it silly to use two transfers to bring in both. So whoever of the two starts, I frankly don’t give a damn and then reassess the situation next month. My strategy is simple really – I put players in who I think will score the most points while they are in the team. I don’t talk about the likes of Lukaku because they’ve not scored well which is why I’ve not picked them or considered them so far. I’ve struggled a little bit to keep up with the comments this season but my posts are generally about my team and the players I’m putting in and the reasons for doing that. I don’t really mention players that I’m not planning on putting in. I’ve never said I want to stick to the exact template – I’ve had the likes of Schemeichel, Lindelof, Shaw, Kepa, Doherty. I was very early in getting Laporte in before his good run. I don’t just go with the crowd but I will only take calculated risks. For me the bottom line is – differentials only work if they score more than the big players who they are in instead of. Most of the time they don’t. Do you play FPL RR? That game seems to require much more thought and differentials can play a huge part. With DT though we have to look at teams who have the most opportunities of scoring points. The biggest opportunities will nearly always lie with the big teams due to their (usually) higher number of fixtures. Therefore I can see why people will gravitate to those types of players. With FPL though I think you can only really afford about four premium players then you have to get creative with the rest. I’ve not played it yet (playing DT is my first go at playing fantasy football of any sort) but I’ll have a go next season, alongside my DT entry of course. DT is great because every game played means something, whereas FPL only counts PL games but that opens the door a little more for players outside of the big 6. I could see you thriving at FPL RR. I think FPL is even worse. The herd mentality is very influential as it governs price changes. If you don’t follow the crowd your team value suffers. I like playing telegraph fantasy football. That’s my favourite. Your O’Sullivan and Davis comparison kind of proves my point RR. There is more than one strategy that can bring success in DT and they can be just as rewarding (points wise). Both Ronnie and Davis are/were both brilliant at what they do/did and both players should be held with highest regard for their achievements. I applaud the guy at top of the rankings. He has been top for nearly two months now which is tough doing. I admire his choices of Odoi and Gundogan, two players I never thought off but I don’t they are in his team by luck but by strategy. Even the sun wrote a piece on his team and the merits of choosing Odoi. So it seems you got a maverick streak inside you to get in front of the pack. There are other strategies out there. The beauty of the game is that we do have different viewpoints and to me it’s not about whose is right or wrong, whom is better. I find the discussion the most interesting. Nowadays I find things outside the norm more interesting, take for example when Chris you decided to bring in Arnautovic you gave your reasons why and perfectly good reasons. That got me interested and I had the opposite view and listed reasons why I wouldn’t. Now it’s not important to me if which side was right or wrong. I was happy to have that discussion. Now when Salah joined Liverpool I wrote two pages on him as I didn’t know much about him. Now I can summarise his merits in one sentence. So basically I like reading and researching about players I know nothing about and generally if I like what I see or read I put that player in team regardless of who he plays for or his ownership. Maybe I don’t play the conventional way but I like to do things my way. Yeah, I love seeing the different ways of playing the game. Arnautovic was ultimately a mistake (the second time round when I brought him in). He’d had injury doubts hanging over him and I still went ahead and made the swap. I certainly won’t be in a rush to bring in players with injury concerns in the future that’s for sure. My main ML rival has just put in Kante which seemed an odd choice to me. I can appreciate differentials if they serve a purpose but I can’t see the logic in that one. Great player but not a big points scorer for Fantasy Football purposes surely? Do you think it’s an odd choice too RR or am I missing something? I think we have to change our thinking sometimes, we need to evolve and develop my skills and understanding. learning from our mistakes is one way, the first step is identity them and admit to them which many find hard to accept. I don’t mind mistakes, I’m human, they happen and will happen frequently (the aim is to reduce the amount which some of the best are good at) it doesn’t make me inferior. Something it is important to identify our weak points. On Kante, maybe your rival might was impressed by the goal he scored recently at Palace, sometimes we get impressed by the last game. Kante does have some goal and assist potential and should pick up 3 points for rating every game and he will play most of them. Sometimes consistency is important factor when considering cheap players but yeah not one I would go for. I don’t really see how it’s counterproductive to go for the players who have had the most clean sheets all season. If they carry on like that the gap will just get bigger. I can see the case for not doing it but it’s definitely not counterproductive. I think I just got a different mindset. My first thought is I play to win not play to lose. Some have the Jose Mourinho mentality let’s pack the bus and the aim not to lose. I am always looking at the situation as a puzzle so thinking not how do I ensure the gap does not get bigger but how do I reduce the gap. Only then can you overtake the person above you. So let’s say you got two Liverpool defenders, the person above has three (most people have that) and 100 point gap. Every time Liverpool keep a clean sheet the person above you is increasing their lead by a 5-8 points plus they probably had these Liverpool players from the start so got for around 1m cheaper. So that gap is still increasing every time. Now you decide to stop the rot and bring in another Liverpool defender. The person above you doesn’t mind in fact you are playing into his own hands. He is not worried as the gap is still there and you have used two transfers. So the person in front is in charge and dictating the play. He might even add another Liverpool defender (TAA or Gomez are two options) so now back to square one, you might follow the same way and use three transfers to his one to get his same defence as you don’t want the gap to increase. So in this scenario you are reducing the gap but the gap is being maintained and not being reduced as all. So the use of transfers for Liverpool defenders is counter productive. It may stop from falling down the rankings but might help going up so little gains. You got think positively about finishing in the top 1k or higher. For me, that’s always the benchmark for a successful season. Same in telegraph game. In FPL, most people’s target is 10k out of 5 million. I do completely understand that if you simply follow the Liverpool blocks you won’t catch them up as you’re all cancelling each other out. However there is another side to that. If they carry on keeping clean sheets and the players you bring in instead don’t then you’ll just fall further behind. If you’ve got frustrations about people not discussing such topics though, you’re more than welcome to write some posts of your own. I’d be happy to publish them and that could get the conversation going in the comments section of those posts? ok, I understand you don’t want to fall further behind but how do you overcome that gap? It’s still there and its got to be overcome somehow in order to win. The person above is unlikely to get rid of the Liverpool defence that has served him well. I’m top (just) so I don’t need to close the gap. And I never went for the Liverpool block. Got coverage for Chelsea, City, Liverpool and Man Utd which I’m fairly happy with. I may look at bringing in a second Liverpool defender at some point though to prevent other people catching me up. As I say though if you’re really keen to discuss other topics you’re more than welcome to contribute articles to spark the discussions. I’m sure everyone would appreciate more content. These Liverpool blocks are a big problem for me and many unlucky others as they dominate most mini leagues and higher overall ranks. A problem to be solved if I want my team to push up the 1k ladder. Anyway, maybe a generalisation of fantasy football strategy is that it like a balance with two scales on each end. One side is the differentials and the other side is the essentials. To maintain a good consistent level, the scale must be balanced. However, if we are in front we have to tip the load more on the essential scale and if we are behind then load up on the differential side. Hope that makes sense. Overall it has been a good debate, two different ways looking at the game, it would have been nice to other viewpoints other than Chris. Just written an article on my strategy on the use of transfers. Hope it is useful. Looks really useful – I’ve just posted it up. Thanks for sending it over. Anyone know if Aguero will drop or rise in price tomorrow? Not been following the price changes but guessing Aguero is likely to drop in price tomorrow. I don’t think anyone is interested in Higuain for 4.5? It is tempting but I’m not one for risking it on players who are unproven in the Premier League. He could easily be another Morata but on the other hand he may solve their problems and start banging them in straight away. Interested to see everyone planning on spending the Kane money? So does that mean that everyone is writing off 2 March transfers to get him back in? Anyone considering banking the money? I suppose with him being out for a while, it could be used elsewhere to good effect. It has to be Aguero for me. He’s far better than Jesus. It’s just who gets what games though I suppose. There’s a good chance that Aguero will be used against tougher opposition, allowing Jesus to fill his boots against the lesser teams – again! With him being out for so long I’ll definitely be looking at replacing him and using the additional funds to strengthen elsewhere. DTT what do you think about using the 3rd transfer aswell now ? Maybe Stones in for Doherty ? Only two weeks until 3 more transfers and that would seem to make the team stronger ?? Double up on city defenders at the back withall these fixtures etc too? It’s not a bad shout but we’ve seen how quickly things can change regarding injuries. I’m keen to hold at least one transfer – I’m not 100% convinced about taking Mane out but it’s not really a risky move. I also wouldn’t want to have to use three transfers to get Kane back in. I’m keeping an eye on the Europa League fixtures coming up in February as an opportunity to gain some extra points so I’m keen to hold as many transfers as possible. Would be great to get some thoughts tonight if people see it. Option B for me as well. Ado you guys own Kane and what are your plans. Turns out with price changes I can do option b with Laporte so likely to go that way now. Yes, if you can switch Laporte in for Stones, then option B with Laporte is a no-brainer for me. I know Rashford could get a run, but how many goals do city score in comparison to Utd? And city have another Burton game, and a favourable FA cup draw in Burnley as opposed to Utd having Arsenal. Long-term as well in Champions League, City have Schalke, and Utd have PSG! The only reason people (myself included) are being a little reserved in recommending Aguero, is because Jesus has had a good couple of weeks. You just don’t know who Pep is going to pick each week. I have Kane yes. I only have one transfer left for the month, so am putting Aguero in for him. Then I have 3m to upgrade a couple next month. Struggling to split A and B. City have the fixtures and extra games so I think rules out C. I’m just getting a really good feeling about Rashford for this second half of the season. The Jesus situation will hang over Aguero for a while yet as well where you’d expect Rashford to start every game for a good while now. Good luck with your decision Dan. It would be option B for me. Just take the plunge and ditch Mane! You’ll probably find that the high ownership in your ML is partly due to nobody having the balls to offload him first and they don’t want to lose ground. Once one or two people ditch him, you will all be like lemmings!! I had him for the opening few games of the season and his early points haul had me thinking he was a season-long keeper, but I ended up ditching him months ago when he got injured. Yes he can cause damage on his day and yes he will probably score points the second you take him out (they all do), but it’s not like you’d be removing someone like Kane who’d be consistent with it. As for the whole Aguero/Jesus debacle, I totally agree with you. Aguero is a much sounder choice. I don’t rate Jesus much either. Yes, he scored 7 goals in 8 days, but that was against very easy opposition and a penalty. That said, call my cynical, but unless you have both players, I can’t see this move working out for anyone!! I think that Aguero will start against Huddersfield, but then be benched for Burton, so the chances are, we’d bring him in this weekend then have to watch Jesus bag more goals against easy opposition…. I’d agree with you there Lee. I’m almost certainly going to go with Aguero and it will probably go the other way. However if I go with Jesus it will probably be Aguero who has the good week. Mane is almost certainly gone for me as well but it wouldn’t then surprise me to see him hit some form. With Kane our for the foreseeable, is anyone considering bringing in Lamela? By all accounts he’s playing as a false 9 on Sunday. Potential bargain at £3m if these reports are true? Having said that, I’d expect Son to come back in and take the striker role when the Asia Cup is done and dusted. I’d put this one down as a “wait and see”. Lamela does pop up with a few goals when competition in the team is low, but he is a bit of a sick note. He seems to be in and out the team regularly due to injuries. So do I do the transfers now or wait until 2.30 tomorrow? If the Kane substitution is needed to fund the Mane > Sterling switch (which I suspect it may be), then you will need to do the transfers by 3pm tomorrow. If on the other hand you have the funds to swap Mane > Sterling without losing Kane, then you can do that tomorrow and then save the Kane > Aguero switch until Sunday so you can see who City are fielding, although from what DTT was saying, he plans to make the switch irrespective of whether Aguero starts or not. I’m just going to do it now because I won’t have the chance to see Man City’s line up. I need some advice for Feb transfers. I know prices could change from now until then, but after using my last transfer on Kane to Aguero this week, means I will have to wait to spend my banked money. I am thinking of possibly using 2 transfers at the start of Feb and getting rid of Foster and Taylor. With £3m to spend, who do you think I should replace them with? Foster is £2m and Taylor £1.2m as it stands. So I expect to have around £6m to spend come February transfers. I could either try and get 2 from same team for a small block, or cover areas that other top-10,000 teams have such as a city or Chelsea defender/keeper. I suppose an extra Liverpool asset may curb any clean sheets they get as I always seem to go down on the leaderboard when Liverpool keep a clean sheet. 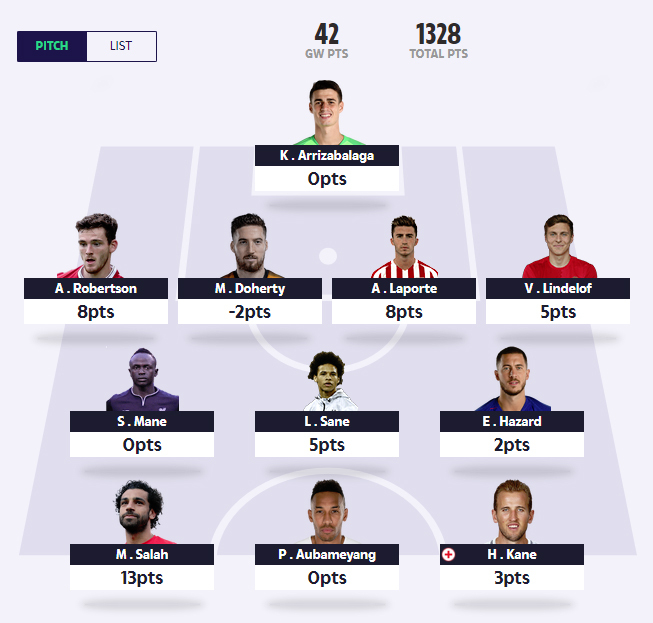 I am 1st in my ML, with a 100-point lead on 1336 points, so not really too bothered about who my ML oponents have, but am keen to try and improve on my 6269 position on the overall leaderboard. Or flip it round and go Ederson and possible preira the Leicester right back who is very attacking and picks up a few assists and goals. I was going to use my last transfer this week to change Taylor to Lindelof as I just had enough money to do that. But the Kane injury threw that one out. Seeing as I have the money (as it stands) to swap Taylor to Lindelof any way, then I may look to do that and upgrade the keeper. Then, I would only have to make 2 transfers to get Kane back in, and not all 3. Hadn’t really considered Leicester. They have a nice run from middle of Feb having looked, but have Utd and Tottenham at the start of the month. Would that put you off? I think Ederson is a good shout. I would have considered Kepa as well, but him being more expensive than Ederson makes him not worth it for me. Although he could pick up some easy points in the Europa. Cheers for the input, mich appreciated. Depending on how the price changes go, you may be in with a chance of affording De Gea and Gomez Chris. Gomez is due back around then so worth considering. You might just time it right when De Gea’s price begins to go back up as well. Great shout to be fair. I do really like the prospect of having Gomez in as he is ao cheap in comparison to the rest of the Liverpool back line. Yes, had completely slipped my mind to be fair. He is so cheap considering their form. Definitely will be monitoring the price there! Higuain going in to dreamteam priced at 4.5, double act alongside Hazard, any takers. Not confident that he is going to do well. I mean Juventus don’t want him, Milan don’t want him, he hasn’t been scoring goals and he’s coming to a league which is twice as hard? You never know, sometimes it just fits and they hit the ground running, but I’ll definitely want to monitor it to start with. Good price if he does do well though.